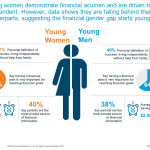 Poor financial habits can impact women early on, beginning in their teen years, despite displaying more “financial grit” than their male counterparts, according to new data from Charles Schwab. "There’s room for improvement in educating both young men and women. It’s never too early to start talking to kids about good financial behaviors." 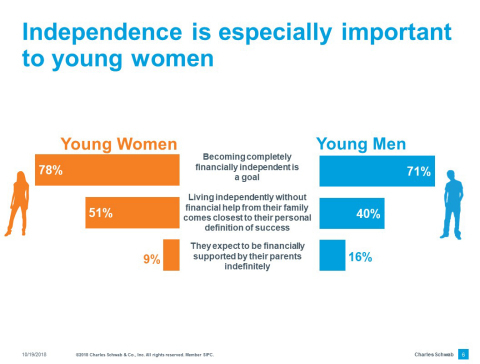 SAN FRANCISCO--(BUSINESS WIRE)--In a survey of young adults aged 16-25, Schwab found that young women are more driven to reach financial independence than young males (67 vs. 58 percent). 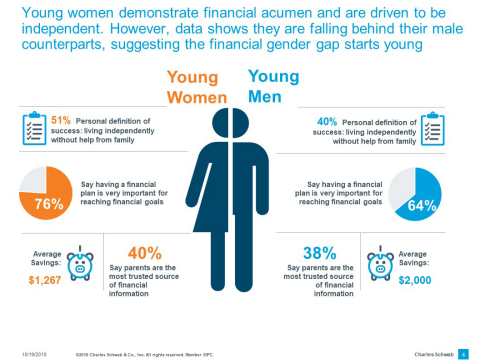 They are more likely to take on extra work to make ends meet (28 vs. 23 percent) and see more value than men in creating a plan to achieve their financial goals (76 vs. 64 percent). Yet, despite all these good ‘first’ measures, they are investing and saving less than young men – falling early into the financial gender gap. More women surveyed (41 vs. 32 percent of men) cited paying off credit card debt as a goal. More than a third of women surveyed (36 vs. 27 percent of men) say they have skipped vacation or travel to save money. While the women surveyed report spending 36 percent less than men, they have far less savings than men ($1,267 vs. $2,000) – a nearly 60 percent difference. 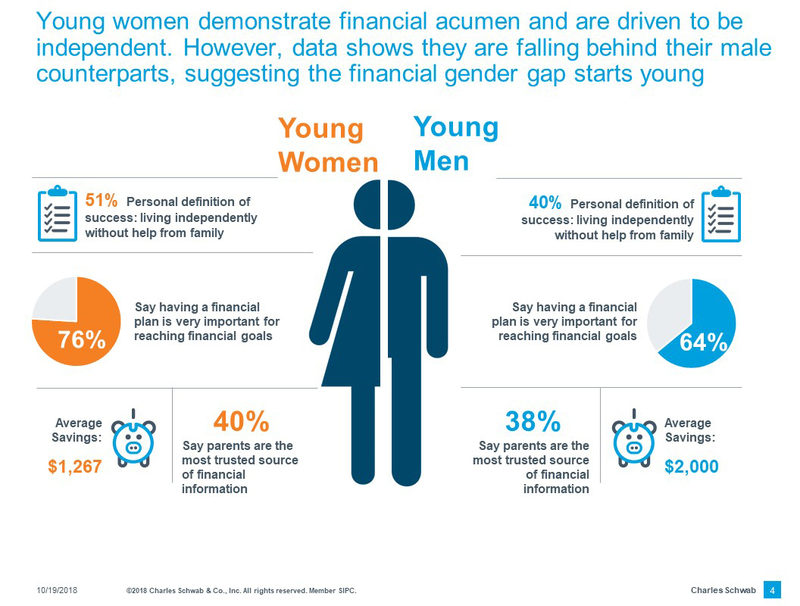 In addition, twice as many young men as women say they would invest spare cash, and almost twice as many young men as women report having investment accounts (though most young adults do not invest at all). Finally, women surveyed were slightly more likely to carry a balance on a credit card, miss a bill payment and ask their parents for money to cover necessities. Parents should be conveying the same messages to boys and girls about money, but you may need to tailor those conversations based on the individual and gender. Our study shows that while boys are spending more than girls, they also are saving more. Have open and honest conversations with your daughter(s) about the wage and savings gap. Teach kids about the importance of investing – especially girls, who as we see in this study, aren’t investing as much. Part of being financially prepared is learning to make the most of your money, and that means investing early and consistently. Encourage your children to take full advantage of a company retirement plan early and contribute at least up to the company match, more if possible. While retirement should be a top priority for everyone, it’s especially important for women, who tend to live longer than men. More information on the survey results can be found at SchwabMoneyWise.com.